Approximately half of a year ago, I purchased the Montane Minimus jacket and since then I’ve been regularly using it as a shell layer on my hiking trips. The Montane Minimus jacket is a hardshell jacket which means that it’s made of a waterproof/breathable fabric. Hardshell jackets are typically lighter than softshell jackets and offer better protection against the elements (rain, wind, snow etc.). However, hardshell jackets also have disadvantages; they are not as breathable as softshell jackets and they are, as the name suggests, somewhat stiff. Therefore, hardshell jackets are typically worn only when the conditions are rainy and/or windy. 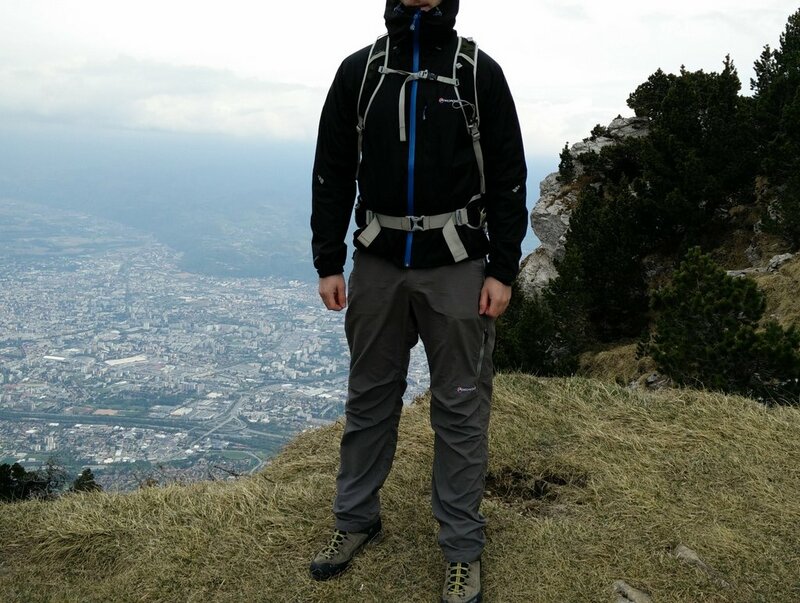 Lately I’ve been mainly hiking in the Alps and I figured out that a hardshell jacket indeed is a handy garment. 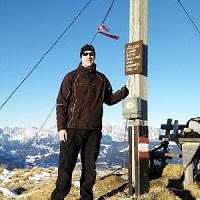 In the Alps it is usually only windy at high altitudes (above the tree line), which makes it obsolete to wear windproof clothing all the time. Instead, the jacket is stored in the backpack for the majority of time. For such conditions a hardshell jacket is a better choice than a softshell jacket as it is easier to pack and much lighter – and having lightweight gear is vital for ascending high peaks in the Alps. Furthermore, a hardshell jacket also offers better protection against rain. 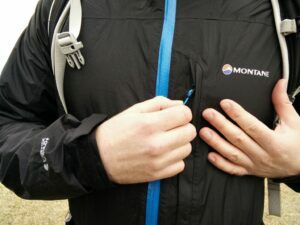 I selected the Montane Minimus jacket because it’s super light, fairly breathable and offers great functionality. 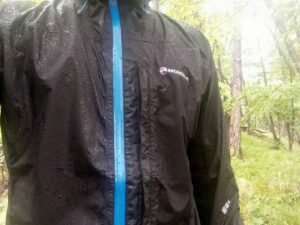 Over the last months I’ve been wearing the Montane Minimus jacket in heavy rain and very windy conditions and here is what I learned. The Montane Minimus jacket is made of Pertex Shield+ material. The Pertex Shield+ consists of a face fabric (ripstop), membrane and protective film on the inside. Therefore, it is categorized as a 2.5-layer waterproof/breathable laminate. Such waterproof/breathable fabrics are typically extremely light while providing good breathability and protection against the elements. To learn more about hardshell materials (laminates vs. coatings, differences between 2-, 2.5- and 3-layer fabrics etc.) check out our article Comparison of Shell Materials. The Montane Minimus jacket is indeed one of the lightest hardshell jackets on the market – it weighs less than 230 grams. The jacket is also super thin (it doesn’t provide any insulation) and relatively stretchy for a hardshell jacket. Therefore, it offers great freedom of movement. It has a hydrostatic head of 20.000 mm which basically means that the column of water in the tube placed over the fabric was 20 meters tall before the fabric leaked. 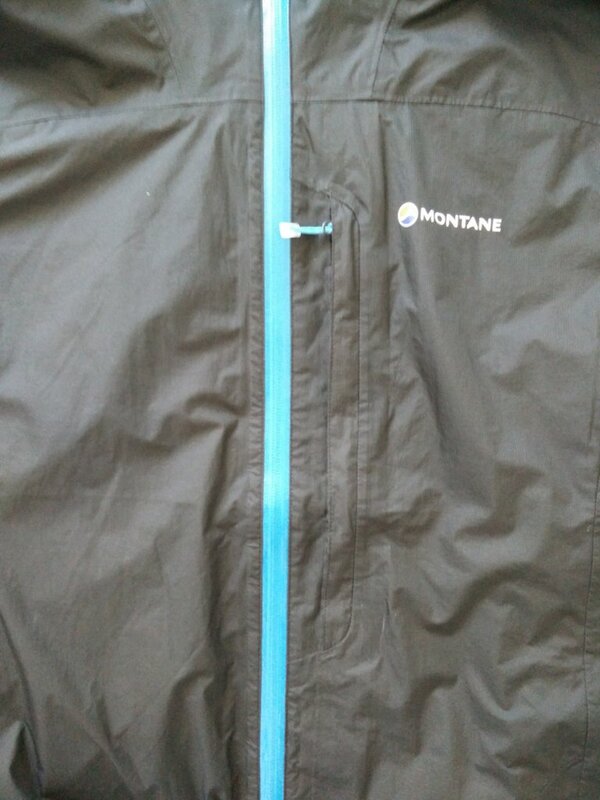 The hydrostatic head of the Montane Minimus jacket is comparable to pricier waterproof garments which utilize Gore-Tex and eVent technologies. The jacket has a MVTR (Moisture Vapor Transmission Rate or so-called breathability) of 20.000 g/m2/24h which is indeed a good result – pricier eVent garments usually have a MVTR between 15.000 and 25.000 g/m2/24h. In order to assess jacket’s field performance, I’ve been wearing it in heavy rain and strong winds over the last couple of months. The jacket efficiently blocks even the strongest winds and offers good protection against the rain. 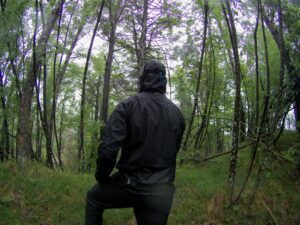 In order to test how waterproof the jacket actually is I executed a 1.5 hour long hike in heavy rain. The membrane efficiently blocked the water and moisture from the outside but I noticed that the DWR treated face fabric didn’t repel the water very good because it’s not very smooth (smooth fabrics force the water droplets to slide off the garment). 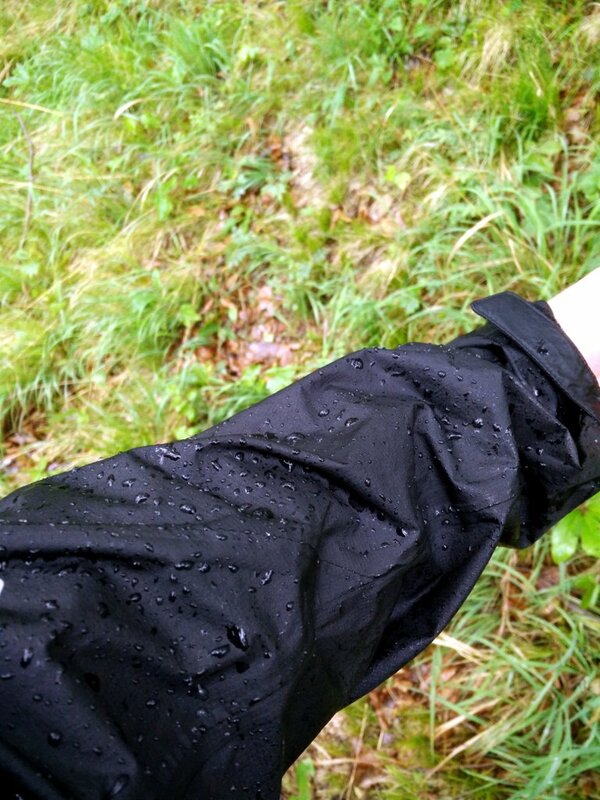 Nevertheless, after hiking for 1.5 hour in heavy rain the jacket only leaked slightly in the arms and shoulders area (see the images below). I actually expected more leaks – keep in mind that there is no such thing as completely waterproof fabric which is also breathable. I was satisfied with the breathability of the jacket. The jacket uses a nonporous polyurethane membrane (as opposed to for example Gore-Tex and eVent garments which use porous membranes) which passes the moisture from the inside to the outside via solid state diffusion. This basically means that the membrane must become wet in order to transfer the moisture to the outside. I can say that in windy conditions the jacket always efficiently transferred the sweat vapor to the outside and kept me dry. Nevertheless, I noticed that in rainy conditions the breathability of the jacket decreases significantly – when the face fabric is wet, the sweat vapor is transferred to the outside much slower. 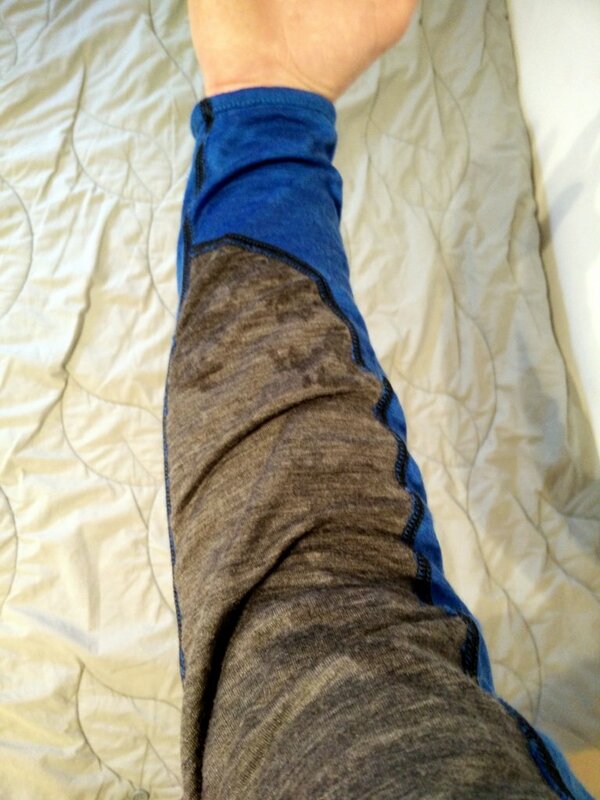 After doing some research, I figured out that most rainwear has this issue – the moisture can’t be transferred to the outside because it gets blocked by water on the face fabric. During my hike in heavy rain I was also wearing the Montane Atomic waterproof pants which are made of Pertex Shield material. The Pertex Shield material is a 2.5-layer coating while the Pertex Shield+ used in the Montane Minimus is a 2.5-layer laminate. 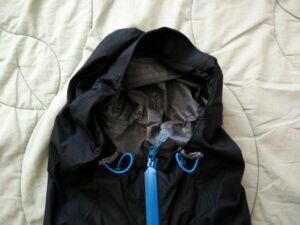 As Montane uses Pertex Shield material for their budget Montane Atomic jacket I will make a short comparison of the materials. The Pertex Shield material is thicker, stiffer and heavier than the Pertex Shield+. Furthermore, it is also much less breathable. However, the Pertex Shield’s face fabric is smoother and thus better at repelling the water. 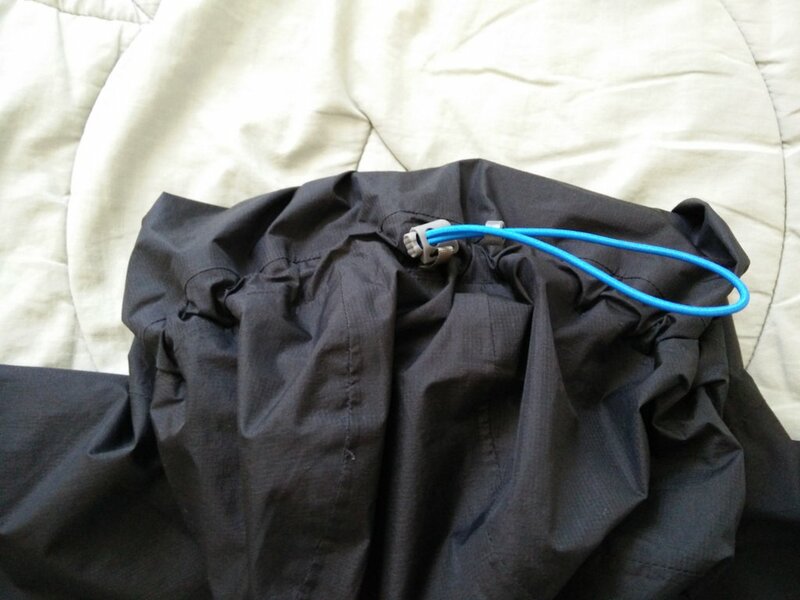 Nevertheless, the Montane Atomic pants leaked significantly under the waist during my 1.5 hour hike in heavy rain while the Montane Minimus jacket leaked only slightly in the arms and shoulders area. Overall, the Pertex Shield+ is lighter and offers better breathability, stretch and rain protection than the Pertex Shield. So, there is a connection between price and quality here. As the jacket is super light and relatively stretchy, you hardly notice that you are wearing it – it offers great freedom of movement. I bought the jacket in size L and it fits me great (snugly but not too tight) even when I’m wearing it over my Mountain Hardwear Monkey Man fleece jacket – my chest diameter is 98 cm and I’m 180 cm high. The jacket is equipped with a fully adjustable helmet compatible hood which can be tightened on both sides in the chin area as well as on the backside. Therefore, it follows your head’s movements perfectly. When the jacket is zipped, the hood stays firmly on your head even in very windy conditions – the jacket has a very high collar and thus you need to unzip it to take the hood off. The jacket is also equipped with an adjustable hem and cuffs for better protection against the rain and wind. It has one big chest pocket which doesn’t have a waterproof zipper. 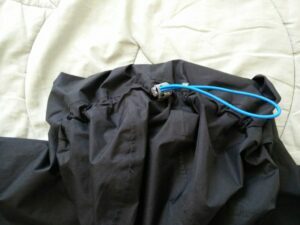 However, the pocket’s zipper is covered with a storm flap and during the testing I haven’t noticed any leaks in this area. Several times I wore the jacket directly over my Woolly Merino t-shirt as the weather was warm and the fabric didn’t cause any discomfort against my bare arms. The jacket is machine washable at 30 C. After the washing it is recommended to reapply the DWR (Durable Water Repellant) so that the jacket doesn’t lose its ability to repel the water. 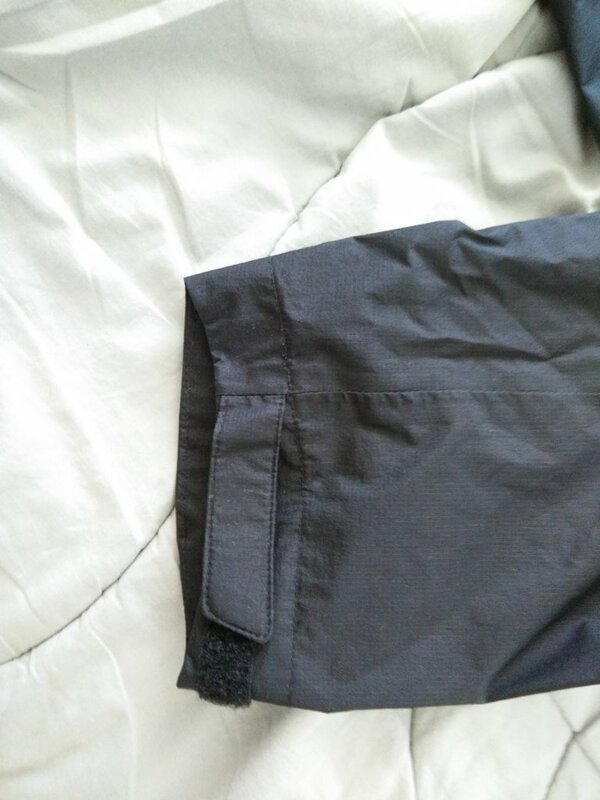 As the jacket absorbs very little moisture (the fabric is super thin), it dries very fast. 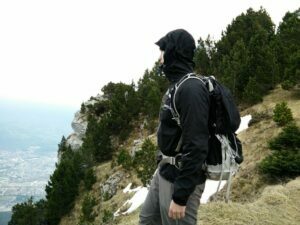 So far I’ve worn the jacket on the Le Moucherotte and Stol (to be published soon) hike as well as on several shorter hikes in the Alps. I’m very satisfied with the jacket as it is super light while providing good protection against the elements. Furthermore, it is also breathable and quite stretchy for a hardshell jacket. 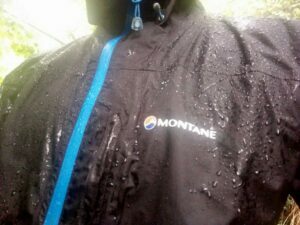 Therefore, I would recommend the Montane Minimus jacket to every hiker, trekker, mountaineer or climber who wants a top-notch rain jacket in medium-price range.